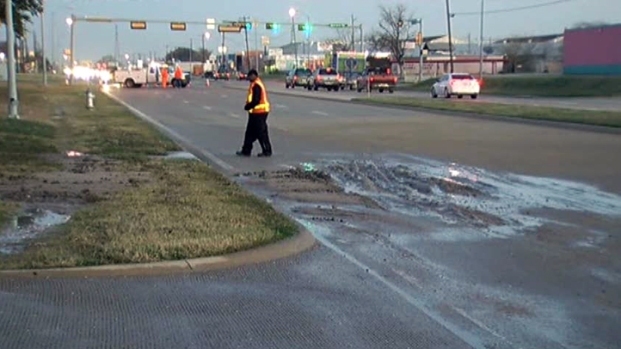 Water leaks caused icy roads in at least three busy Dallas locations early Wednesday morning, and slick spots could return Thursday morning with temperatures forecast to dip below freezing again. Police blamed a crash that injured a driver early Wednesday on Harry Hines Boulevard between Northwest Highway and Walnut Hill Lane on icy conditions caused by water from a major water main break. Water leaking onto the roadway also caused ice on Central Expressway near Mockingbird Lane, where police placed flares to warn drivers. Another icy spot on a Central Expressway feeder road just north of Interstate 635 at the High Five interchange was blamed in a crash where a vehicle hit the natural gas service pipes for an Embassy Suites Hotel. City officials encourage residents and businesses to turn off their sprinklers in freezing temperatures. Officials blamed the ice on a faulty sprinkler system at a neighboring hotel. City code requires sensors on sprinkler systems to shut the water off in freezing weather. Dallas code inspectors look for leaking systems in a freeze. "It's a case-by-case basis for sure, but if we feel they were negligent, we'll issue a citation," said James Childers, of Dallas Code Enforcement. Inspectors visited the High Five hotels but did not issue citations Wednesday because repairs of faulty equipment were quickly under way. "We talk to our staff across the city to have their eyes open, look for potential violations," Childers said. "And an important thing is, if the public sees a sprinkler going off in freezing temperatures, to call it in to 311." A city water pipe was leaking on the same access road near the High Five Embassy Suites on Wednesday afternoon where ice caused the earlier wreck. "It's been a longtime problem, and it's gotten worse in the last few weeks in particular," neighbor Bill Tiede said. "And now that it's freezing, it looks like it may be a little dangerous getting in and out of our own parking lot." Childers said code inspectors do inform the city water department about leaks they find but do not cite the city. The city water leak on that access road was much smaller than the others that caused accidents earlier. But he said drivers should beware of others that may appear overnight.